The 3M Scott Safety 7400 Quadscan II Four Channel Controller offers an abundance of built-in, flexible features that make it the ideal receiver to economically centralize display and alarming for up to four gas transmitters, fire detectors, or other 4-20mA instruments. 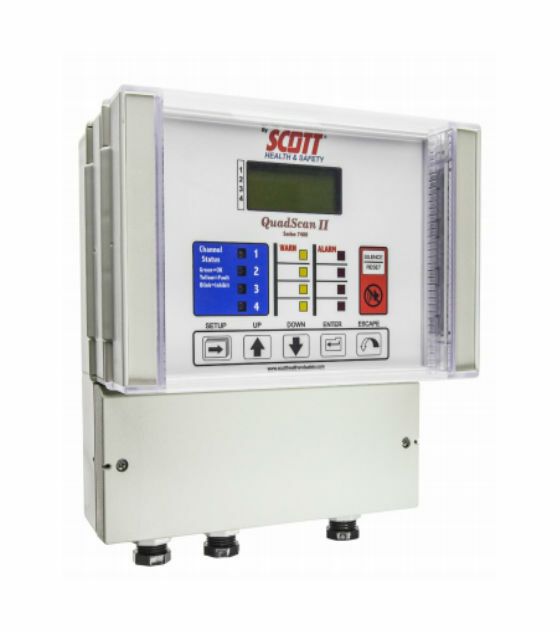 The QuadScan II receiver offers an abundance of built-in, flexible features that make it the ideal receiver to economically centralize display and alarming for up to four gas transmitters, fire detectors, or other 4-20mA instruments. QuadScan II's in-the-field "Channel Expansion" feature allows users to initially purchase only the channels they need. Unused channels can then be easily activated with the purchase of a passcode. Housed in a NEMA-4X wallmount enclosure, the QuadScan II receiver provides power to 2-, 3-, or 4-wire transmitters and is available with an uninterruptible, battery-backed power supply to ensure constant operation during power outages. The highly visible interface includes a backlit LCD and bright LEDs that display each channel's concentration and alarm status while the built-in, 85 decibel horn provides audible notification to personnel of alarm conditions. The LCD's six alphanumeric characters can be programmed to identify each input. Standard concentration units such as PPM, PPB, or % are selectable. The QuadScan II receiver provides 4-20mA outputs for retransmission to other system controllers such as a DCS or PLC. Outputs are easily field calibrated to overcome line loss. The QuadScan II receiver provides common low alarm, high alarm, fail, and horn relay outputs. The alarm relays can be programmed to operate as latching or non-latching. A front panel "horn silence" button silences the onboard buzzer and deactivates the horn relay during alarm conditions, while the "reset" button deactivates latching alarms when alarm conditions have ended. For additional relay options, the QuadScan II receiver offers powerful relay programming features through an separate optional external relay module with a built-in power supply that provides eight individual 5 amp relays.